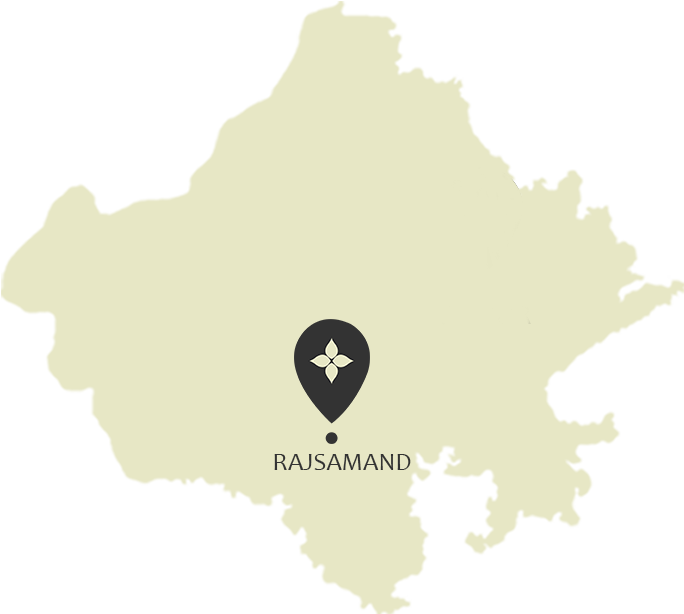 Rajsamand is located around 67 km from Udaipur. Apart from being quite well known for marble production and being the largest marble producing district in the country, Rajsamand is also a town that houses beautiful lakes, awe-inspiring palaces, great historical significance and also a national park. For any visitor, Rajsamandlives up to every travel expectation you might have, and at times, even surpass them.Among the most famous spots in the district are the Kumbhalgarh Fort, the place where Maharana Pratap was born; Haldighati, the famous battlefield; Dwarikadheesh; Charbhuja; and a number of Shiv temples.Rajsamandmakes for a fascinating visit,offeringyouthe opportunity to glance and bask in its rich history, religion, culture, and mining industry. Come explore the wonders and sites that Rajsamand has to offer. There’s always something to see in Rajasthan. BIRTHPLACE OF MEWAR'S LEGENDARY KING, MAHARANA PRATAP. Located 84 kms north of Udaipur in the wilderness, Kumbhalgarh is the second most important citadel after Chittorgarh in the Mewar region. Cradled in the Aravali Ranges the fort was built in the 15th century AD by Rana Kumbha. The inaccessibility and hostility of the topography lends a semblance of invincibility to the fort. It served the rulers of Mewar as a refuge in times of strife. The fort also served as refuge to King Udai of Mewar in his early childhood when Banbir killed Vikramaditya and usurped the throne. It is of immense sentimental significance for the people being the birthplace of Mewar's legendary king Maharana Pratap. The fort is self-contained in all respect to withstand a protracted siege. Its defences could be breached only once by the combined armies of the Mughal and of Amber primarily for scarcity of drinking water. There is a magnificent array of temples built by the Mauryas of which the most picturesque place is the Badal Mahal or the palace of the clouds. The fort also offers a superb bird’s eye view of the surroundings. The fort's massive wall stretches some 36 kms with a width enough to take eight horses abreast. Maharana Fateh Singh renovated the fort in the 19th century. The fort's large compound has very interesting ruins and a walk around it can be very educative. The Golerao Jain Temples are one of the most important attractions of the Kumbhalgarh Fort. It is a group of nine temples that are located in a beautiful area of the fort that elicits a certain mystique and serenity. Situated pretty close to the Bhawan Devi Temple, the Golerao Jain Temples are adorned by a number of beautifully carved sculptures of gods and goddesses on the walls and pillars, all of which combine to lend it an impressive character. The NeelkanthMahadev Temple is a very famous Shiva Temple which is located in the Kumbhalgarh Fort. The temple was built in 1458 AD and has a six feet high Shivling, made of stone. One of the unique featuresof this temple is the fact that you can enter it from all four directions, which is commonly referred to as a Sarvatobhadra temple.In addition to that, the temple has an open mandap that is visible from afar.Located east of the Vedi shrine, you can experience a beautiful light and sound show that is held at the Neelkanth Mahadev Temple every evening.The rustic ambience offered by the temple and its surrounding area is quite a sight in itself, turning the visitor in you into an ardent admirer. The Kumbhalgarh Wildlife Sanctuary can be rightly considered as one of the major attractions for tourists who visit Udaipur and Kumbhalgarh. Located about 65 km from Udaipur, the park is on the Udaipur - Pali - Jodhpur road, and encircles the massive fort of Kumbhalgarh. Whether you are a wild-life lover or just someone who wants to commune with nature, the Kumbhalgarh Wildlife Sanctuary has the perfect setting for it. Spread across parts of the Aravali range as well, the sanctuary is home to a number of endangered species. It offers you the chance to catch a glimpse of jungle cats, hyenas, jackals, leopards, sloth bears, nilgai, sambhar, chausingha, chinkara, hares, etc. You can even follow wolves around and see them engaged in their activities. Apart from the animals, you can also gaze at a number of birds at the sanctuary. Kumbhalgarh Sanctuary is blessed with a variety of flora that includes a number of trees and plants that exhibit herbal properties. Missing out on this wildlife sanctuary when you are in the area is missing out on a tête-à-tête with nature itself; now you wouldn’t want to do that, would you? It is a huge expanse of water 66 Km. north of Udaipur, between the towns of RAJNAGAR and KANKROLI. The lake was the result of a dam constructed across the Gomati, Kelwa and Tali rivers at the southwestern end by Maharana Raj Singh I, between 1662 and 1676 AD. The reason for the dam and lake was to provide employment for victims of a widespread drought and famine (1661), and to provide canal irrigation to local farmers. During World War II Rajsamand Lake was used as a seaplane base by Imperial Airways for about six years. Rajsamand Lake is the oldest known relief work in Rajasthan and cost almost 4 million rupees. With a circumference of 22.5 Sq Km. the lake is quite awe- inspiring with a depth of 30ft and a catchment area of about 524 sq km. As large as it is, the lake has been known to disappear in times of severe drought: for instance in 2000 it was merely a huge, empty basin with a surface of dried, cracked mud. Engage in the many activities, tours and adventures that await you in Rajsamand. There’s always something to do in Rajasthan. Well connected by Road to all major Cities like Jaipur, Jodhpur, Delhi, Ahmedabad, Mumbai etc.